Our Abpromise guarantee covers the use of ab26303 in the following tested applications. WB 1/2500. Detects a band of approximately 32 kDa (predicted molecular weight: 24 kDa). Block with 5% milk and dilute in TBST only. May serve as an important signal transducer for a novel upstream stimuli in controlling cell proliferation. Weakly activates the MAP kinase pathway. Expression highly restricted to the brain and heart. 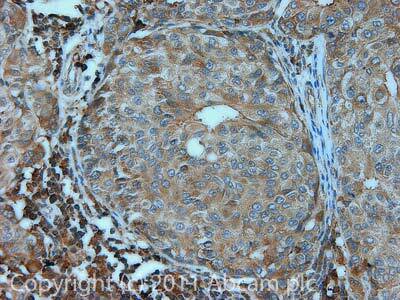 ICC/IF image of ab26303 stained MCF7 cells. The cells were 4% PFA fixed (10 min) and then incubated in 1%BSA / 10% normal goat serum / 0.3M glycine in 0.1% PBS-Tween for 1h to permeabilise the cells and block non-specific protein-protein interactions. The cells were then incubated with the antibody (ab26303, 1/1000 dilution) overnight at +4°C. The secondary antibody (green) was Alexa Fluor® 488 goat anti-rabbit IgG (H+L) used at a 1/1000 dilution for 1h. Alexa Fluor® 594 WGA was used to label plasma membranes (red) at a 1/200 dilution for 1h. DAPI was used to stain the cell nuclei (blue) at a concentration of 1.43µM. Observed band larger than predicted size, thought to be due to post-translational modifications. IHC image of ab26303 staining in Human breast cancer formalin fixed paraffin embedded tissue section, performed on a Leica BondTM system using the standard protocol F. The section was pre-treated using heat mediated antigen retrieval with sodium citrate buffer (pH6, epitope retrieval solution 1) for 20 mins. The section was then incubated with ab26303, 5µg/ml, for 15 mins at room temperature and detected using an HRP conjugated compact polymer system. DAB was used as the chromogen. The section was then counterstained with haematoxylin and mounted with DPX. ab26303 has not yet been referenced specifically in any publications. Publishing research using ab26303? Please let us know so that we can cite the reference in this datasheet. There are currently no Customer reviews or Questions for ab26303.